UNESCO is organizing a photo competition starting on World Environment Day (5th June 2016) with a closing date of 31st of August and culminating in the award of prizes on 10th November on the occasion of World Science Day for Peace and Development. 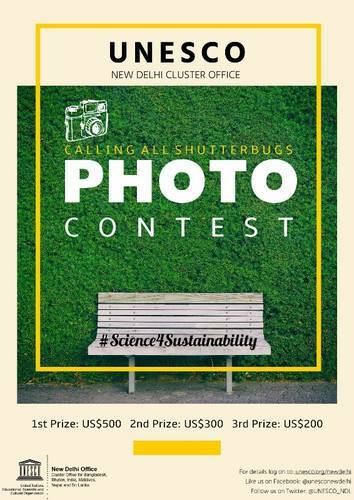 UNESCO New Delhi Cluster Office has launched a social media campaign ‪#‎Science4Sustainability with a Photo Contest on the theme Science for Sustainable Future. You can submit your entries at the email mentioned below. The four winning entries will have the honor of being displayed at the UNESCO New Delhi office’s new premises in the diplomatic area, New Delhi. 1. Photographs must be submitted under the chosen category(s), with your name and residing country along with a short description of the photo in not more than 30 words,latest by 31 August 2016. For full information on eligibility and selection process click here.